The all-American comfort dish of macaroni and cheese doesn't always have to be fatty, heavy, and greasy. Sure, that's what most of us come to expect from it, but there's a healthy way to indulge in this treat too. Whip up this surprisingly simple one-pot version, and in no time, you'll be chowing down on probably the healthiest, heartiest, and tastiest mac 'n cheese you've ever had! This dish doesn't only contain pasta and cheese, but a nice amount of broccoli too. And it's not your standard macaroni, it's the whole-wheat version which not only lends a nutty and hearty flavor to the dish, but healthy fiber- and protein-enriched nutritional value. The frozen chopped broccoli is added to the boiling pasta water (what a clever idea!) until both are cooked to the appropriate doneness. The cheese sauce is made stovetop, and it's ready in about 5 minutes. Simmer lowfat milk in a pot, then whisk in a mixture of milk, flour, garlic powder, salt, and white pepper until everything starts to thicken. Finally, add in shredded cheddar, Parmesan, and a little Dijon mustard. 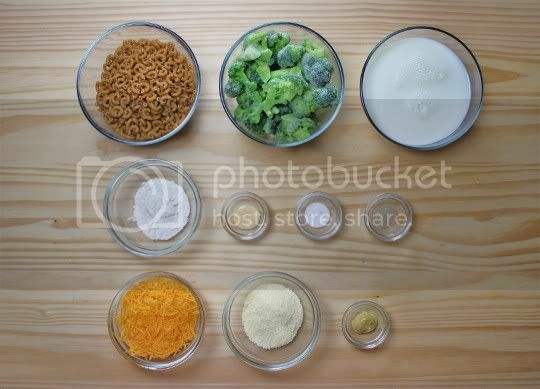 Stir the drained and cooked pasta and broccoli into the sauce, and you're done! How fast was that! 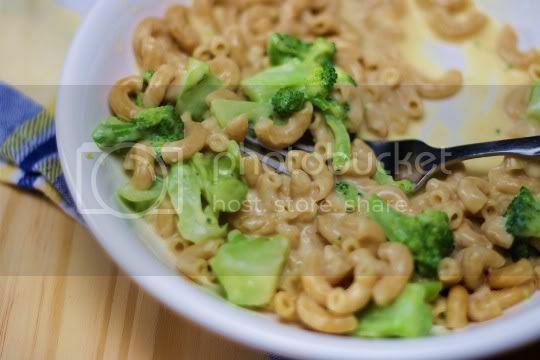 One of the things I really like about this sauce is that there's a lot of it: it coats every noodle and every piece of broccoli, and there's even a bit left over. That being said, the sauce isn't soupy or unappetizingly thin (this is still supposed to be mac n cheese, after all). Its texture is perfect for what it is...a lowfat cheese sauce. And the sauce itself has delicious flavor: it's garlicky, salty, and cheesy, with a bit of heat from the pepper. I would highly recommend using the extra-sharp cheddar suggested in the recipe for a more intense cheese flavor; I used a sharp version, and I know that the extra-sharp would have taken this to the next level. The dish is so filling, hearty, and satisfying. 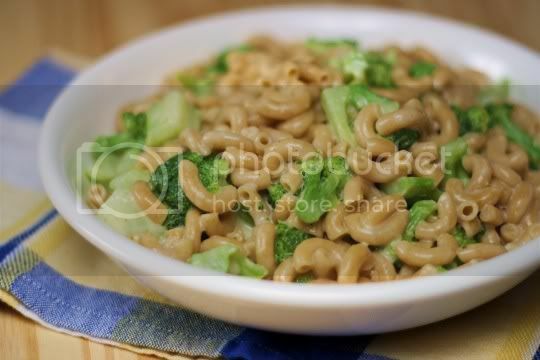 The nutty whole wheat pasta goes so well with the mild woodsy broccoli, and there's broccoli in each bite you take (this would be a GREAT dish for kids, and a great way for them to eat their veggies!). An amazing subsitute for the regular, fatty, heavy, and rich variety, try serving this at your next meal and get ready for the rave reviews! Make again? Stovetop mac n cheese that's ready in 10 minutes or less (and healthy)? Yes please! Vegan variation: Use nondairy milk, vegan cheddar shreds, and a vegan Parmesan (or even nutritional yeast! ).